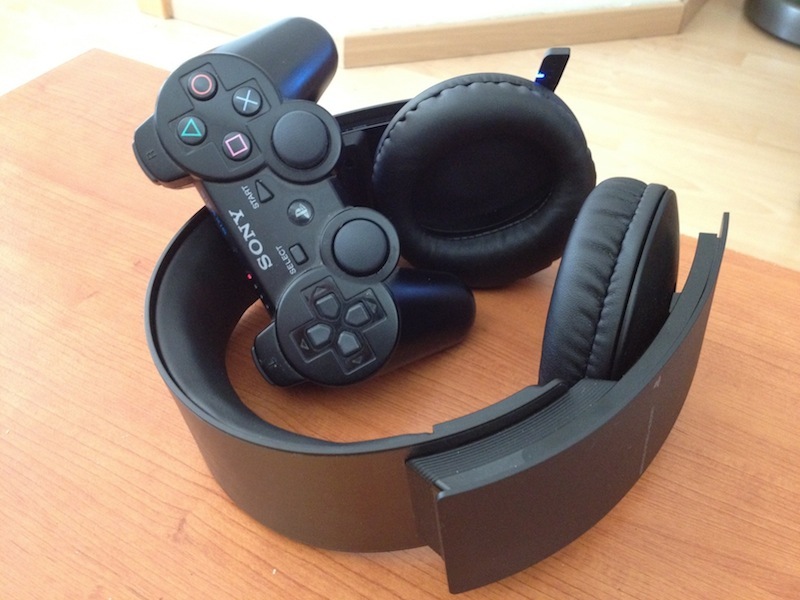 Since I listed the Sony PlayStation 3 wireless headset with virtual surround on my top 10 gadgets I want for Christmas list, I’ve received a few questions from TechPatio readers about this headset. Honestly, this headset probably shouldn’t be on the “I want”-list, as I already have it, but I’m just so thrilled about this headset that I think it deserved a spot there. How’s the comfort and build quality of the headset? The comfort is great, I’d almost say fantastic. The build quality is decent, it feels a bit plastic, but it also feels solid enough. The only thing I would worry about is the microphone, it’s built in a way so you have to pull it in/out. Don’t let your kids drag the headset around by pulling the microphone, that’ll probably break it off. I’m not sure it’s even necessary to pull out the microphone in order to use it, I suppose it depends on what you demand in terms of audio quality when speaking. I imagine your voice would be picked up better if you pull out the microphone. What about the sound/surround quality? These are technically a stereo headset, not surround. But, it has virtual surround, and I think it’s really good. The sound quality itself has not let me down, although I’m not an audiophile. But I’ll say, for $99, you get a good headset, and wireless, don’t forget that. I haven’t heard myself speak yet, so I can’t comment on how the microphone is, but I heard from someone else that my voice sounds good enough, and a lot cleaner than al those distorted voices you hear when playing Call of Duty Modern Warfare 3 multiplayer. How many hours of use do you get (battery)? I haven’t measured it, but if I play a few hours in the evenings, I usually have to recharge it after a few evenings, so I’d say 8-10 hours perhaps. How does it connect to PlayStation 3? The headset comes with a small USB adapter, bluetooth I suppose, which you just connect to the USB port on your PlayStation 3. Then turn on your headset – and that’s it, it’s now connected. It should work with computers too, although the virtual surround-part probably doesn’t. What kind of buttons/features does the headset have? The probably number one feature for Call of Duty Modern Warfare 3 players right now, is to control the sound/voice ratio, so if you only want to hear game sounds, you adjust the slider all the way down to “sound”. If you only want the annoying voices from teenagers making weird sounds while they play, you adjust the slider all the way up to “voice”. If you want both, you leave it in the middle. There’s a slider for volume as well. To turn the headset on/off, you push the side of the headset for a few seconds. A quick push on the headset (same place as on/off) will toggle the microphone (mute on/off). Finally, it has a USB port for charging, like the PlayStation 3 controllers. As mentioned, I’m not an audiophile, I just like to game a little bit of PlayStation 3 from time to time and I’ve not once regretted buying this headset, I really like the sound. I only wish that it could have had a little bigger battery, but I just attach it to the computer every now and then, so it’s always ready to give me a full evening worth of game play when I need it. (which is actually also the rating this product has received from 233 reviewers on Amazon USA as of December 4th 2011). Interesting. It would have been better if its surround rather than stereo. However basing on how you describe it, it seems like a great headset that everyone should pay attention to. Thanks for sharing. This looks interesting, I would like to give this to my son, I am sure he will be so much happy, when I bought this latest gadget. Sounds great, been waiting for this review. It’s not that we’ve had any big political debates yet, but from what I’ve heard from you it went clear through. I don’t know what everyone else is using but I have no idea what so ever what theyre saying. I’ve ordered one myself now, amazon still has it in stock. Wow! I didn’t know they had this out. It looks very comfortable. I’m going to check it out for my son. Thanks!! You just gave me an idea on what to buy for my playstation-addict godchild. Thanks! the sony playstation 3 wireless headset has really stunning design, the sound quality of the headphones is great, great gaming headset. Good effort by Sony. However, with regards to the battery I am not quite satisfied as could last a little bit longer. Perfect product for game lover, i have used this thing and it is just wow.. factor for me. I got it!! These are absolutely great, just got em’ today. Scott: I hear you, well, not the waking up the kids part but my wife got them for me as well. She seems convinced I’m going deaf. I keep telling her, games just need to loud. fact. Wow! I hope I can get to buy this cool wireless headset someday. I will surely gonna save some money for this. Next post: Selling your used cell phone – to make room for a new one!